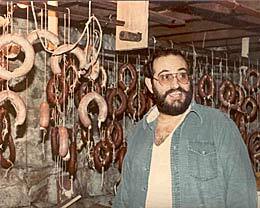 Origin of Supri Sopressata (dry cured sausage) - Dipollino's Italian Family History - Dipper's Packaging Co., Inc.
1970’s: Stuffing the “SUPRI” Sopressata. curing in the “SUPRI” cellar. I grew up in Westerly Rhode Island’s North End in a family with six children; 3 boys and 3 girls. Every year we went through the same routines (traditions). In the summer plowing and planting the garden and picking vegetables all summer long to jar them for winter and then when blueberries were in season we would go with our parents out into the woods to pick wild berries which mother would jar and have all winter long for desserts. Oh those blueberry pies! In late September, early October it was seasonal to go off again into the woods and search for wild Mushrooms. The ones we looked for we called Pinale. Some people call it The Hen of the Woods or The Senorita (see photo left). This too was considered an Italian delicacy. This Mushroom only grew on Oak Trees, most of the time on the base but they have been found 15 to 20 feet up the tree. At my store I do a lot of canning of some old Italian favorites like Pinale and Hot or Sweet Peppers. Fortunately for me this mushroom is now commercially grown and is called Maitake( latin name: Grifola frondosa.) Because of its availability I can purchase it anytime of the year. I ship this delicacy to people (mostly former Westerly residents) all over the USA. It is the second biggest seller to the Sopressata. If you love food then you have to try this dish with either Chicken or Beef or you can as some do eat it right out of the jar. It was the culture of the Italian people to raise and can or jar their own food, besides garden vegetables they raised chickens, rabbits, sheep and of course pigs. All of these animals were used to provide food for the family all year long. 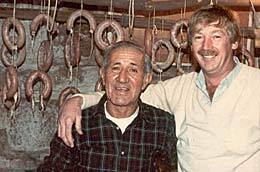 Each family of Italian descent made their own Sopressata every winter in Westerly and as we got older we were allowed to participate more and more in the actual making of this delicacy. With our parents and relatives living through the depression we learned that nothing should be wasted. My mother used to say the only thing not used from the pig was its squeal. Usually right after Christmas we would start making our Sopressata. We would buy the meat all cut and ground, take it home and mix our family’s secret ingredients to it and let it sit overnight usually in the trunk of dads car, the temperature was near or below freezing. The next day I would go out to my fathers car and open up the trunk and bring the Sopressata into the basement and give it a good mix, then bring it back out to the trunk and go off to school. When I got home from school I would repeat this process and make sure that the seasonings were evenly mixed. Mother would have the intestines all cleaned and ready for us to stuff. Back then it would take mother three to four days to get the intestines clean and ready for stuffing. 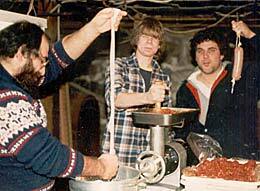 When our father got home we would have supper and then head down to the cellar to stuff the Sopressata. All of us lent a hand in this operation. The younger children would roll the meat into small sized balls while father and I or my older brother would stuff the casings. Mother would always be the lead tie master. She showed everyone how it was done and how she expected it to be done. 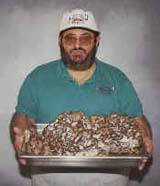 After they were stuffed we would help father hang them in the “SUPRI” cellar. It too was in the basement, the cold cellar as it was called. As the drying started we could smell the fragrance from that delicious meat rising up through the floor but dissipating as the weeks went by. We could not wait to taste the finished product. Almost every household used some thinner sausage casings, which were very thin in circumference and the meat cured much faster than in the thicker “SUPRI” casings, that way people got to sample the product a couple of weeks earlier than the thicker “SUPRI” stuffed casings. Once the “SUPRI” was dried to the desired firmness we would cut down the “SUPRI” and take the strings off of them and submerge the “SUPRI” into oil. Covering them in oil was to keep the drying process from continuing, and stop the “SUPRI” from getting any harder or dryer. In todays modern age we use a vacuum machine to bag the “SUPRI” and thus stop the drying process. Using vacuum and shrink bags help keep our product fresh for several years. Years ago in the old country, as well as in the USA, they rendered the lard from the pigs, placed the “SUPRI” in a stone Crock and covered them with the rendered lard. This too stopped the curing process. When I went into this manufacturing business it took me three years to convince my mother that these modern techniques worked as well as the original methods that she learned almost 100 years ago. Mother was born on January 26, 1910 and she is still going strong at 99! She was born here in Bradford, Rhode Island but as an infant brought back to Calabri, Italy and raised there. 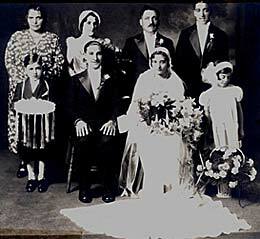 I owe my Italian heritage to my parents John and Angelina Dipollino. My father was from Sicily and my mother was from Calabria.